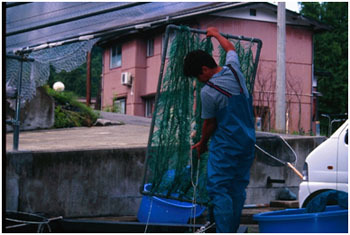 It has been decades since the days when the Japanese breeders used natural spawning methods to produce their offspring. This was when a female was placed in a breeding net together with spawning grasses and then several males of the same variety were placed in the pond with her. Many of the eggs were thrown above the water line and would not hatch; others were deposited in ‘clumps’ and again were useless and it was never possible to accurately assess which male was responsible in producing the best offspring with that particular female. 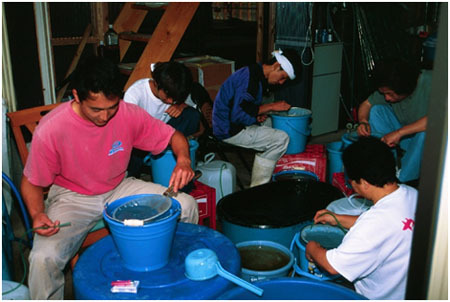 I first witnessed changes to the traditional methods in the early 1980’s where many Koi breeders started using similar methods to those used in the production of food fish and after the sons of several breeders had completed courses at Fish Farming Colleges where all this was taught to them. Today, all the Nishikigoi breeders have adjusted these teachings by way of their own little tweaks and secrets but, for the most parts, these are roughly the same in their attempts to get the highest possible hatch rates from the eggs produced and also be able to accurately use a particular male Koi with a particular female in order to get the best possible quality of fry from his available parent stocks. It is ‘artificial spawning’ in its truest sense where ‘laboratory-like conditions’ are required at the breeder’s premises, although these are often well-scrubbed kitchen areas of the family house. All items of necessary equipment are prepared in advance and are easily accessed when the time for urgent and immediate usage is needed. 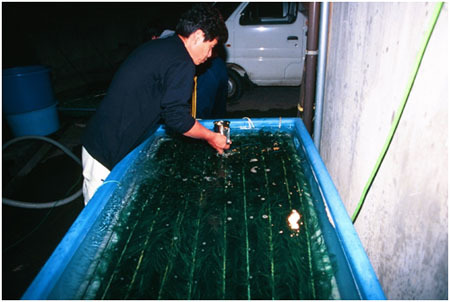 The actual breeding starts as in days of old where assorted females and males were placed in spawning ponds with artificial grasses (kinran) and aeration. Actual dates vary which are dependent on air temperature and advance weather forecasts but this is usually between mid May to mid June in Niigata. Generally a ‘trigger’ is usually needed to start the parent Koi to drive. A sudden sharp raising or lowering of water temperature is usually all that is necessary, and many use large quantities of ice cubes to achieve this. In view of the fact that this is ‘controlled spawning’ it is vital to wait until the first few eggs have been deposited and then immediately remove the parent Koi from the spawning pond. Most spawnings start in the early morning hours of darkness that means that the breeder has to be watching by torchlight for signs of the first eggs appearing. It is only then that the process can commence. Koi eggs have no adhesive qualities until they first come into contact with water, after this they attach themselves to the nearest surface they land upon. In view of this, whilst the breeder is removing the eggs from the female, it is vital that water ever comes into contact with the eggs at any stage of the process. If this isn’t observed, the entire egg production could be wasted on that spawning. 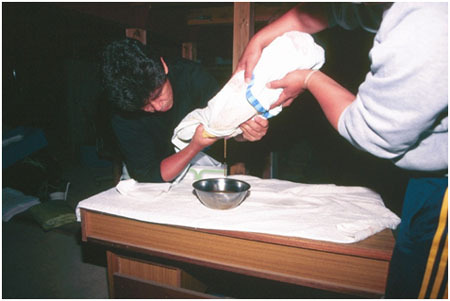 The picture above shows the great care needed here, after the female Koi has been anaesthetised; tissues dry the entire body before she is then completely wrapped in a dry towel leaving only her vent exposed. The eggs will release themselves without any pressure being applied, only the weight of her own body on the breeder’s hands will release the eggs into the stainless steel container below. These eggs can be passed through the fingers as a tapioca-like substance as they have no adhesive qualities as yet. The male Koi required for the specific pairing is then anaesthetised after drying and the milt is removed from the vent by pipette as seen. The milt from one male Koi is not of sufficient quantity to fertilise all the eggs from a single female as required. 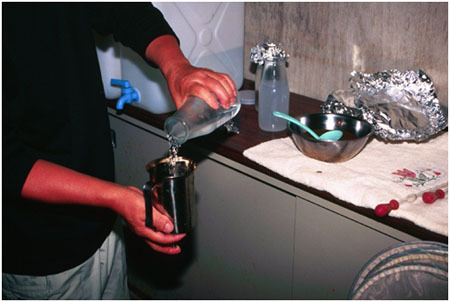 The glass bottle shown in the picture contains a prepared formula of Ringer’s Solution for Carp and the milt extracted is added to this and stirred to produce a larger available volume of fertilisation liquid. This next picture shows the breeder adding the milt solution to the eggs and this is mixed thoroughly with a glass rod to ensure total fertilisation. The stainless steel container seen here has an open exit outlet in the base, which is stopped by the breeder’s finger and this is the container used for the next stage of the task. The solution now ready is only a percentage of the total eggs produced in one spawning where it is not uncommon for a large mature female to produce more than 500,000 eggs. 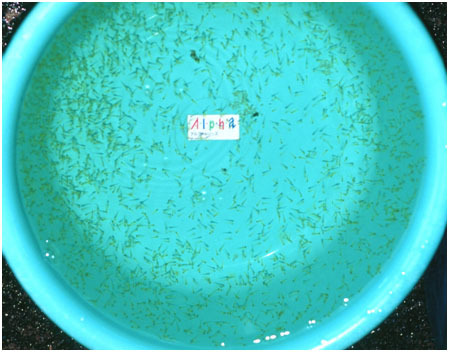 These fertilised eggs are now distributed sparingly and evenly by the breeder along all the fronds of the individual lengths of spawning grass, which are 1.5m long. Once the eggs touch water they immediately become adhesive and they will remain in these positions until they hatch. Gentle aeration is added to the water and, at some outlets, a mild malachite green solution is added as a form of disinfectant. The entire operation is now repeated until all the eggs have been distributed onto other grasses in other containers that have been prepared in advance. Obviously this operation shown is only for one set of parents in one variety, it is not uncommon for most breeders to use over ten different sets of parent stocks at this time of the year. 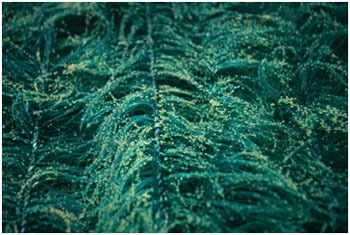 This shows a close-up shot of some of the eggs after they have been distributed and become attached to the spawning ropes. As to the period between the eggs being produced to actual hatching, this is only determined by the water temperatures at that given time of the year. It generally takes between 3 to 5 days for the fry to hatch. Some breeders hatch their eggs in outdoor concrete ponds at their premises whilst others favour transporting them to their mud ponds for this period. Even in the shallow borders of the field ponds, there are different methods of hatching the eggs adopted by different breeders. 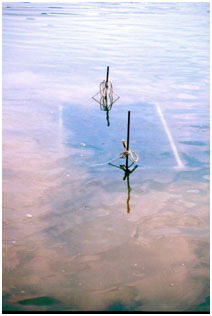 Some transfer the rafts of eggs into prepared 3m x 2m fine nets to prevent frogs and insects eating them whilst others anchor the rafts directly onto the pond floor as shown. As the fry begin to hatch from the eggs, they attach themselves to pond walls and the fronds of the grasses in a vertical position, remaining that way whilst digesting their yolk sacs and, at the same time, inflating their swim bladders. After this period they then become horizontal and are termed as ‘free swimming’, immediately afterwards they are looking for food because, without this, they will die very quickly. The hatching ponds have previously been seeded with urea to produce fine infusorians that are visibly abundant but the thousands of fry deplete these stocks rapidly as they will also decimate the later stages of daphnia in days to come. This is when the breeder comes to the rescue with powdered fry foods fed on a constant basis. This shows free swimming fry harvested from the field ponds to allow the first of many culls to take place throughout the summer months. Most of the family and friends of the breeder assist with this laborious process that can, in some cases, take over 24 hours to complete and so night lights have to be set up. 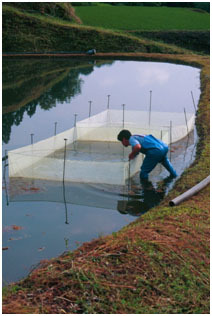 It is a matter of getting the selected fry back into the field ponds before they die in the small containers on the breeder’s premises. 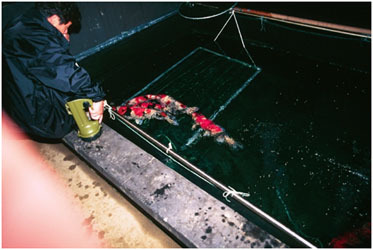 This is a typical culling shot that is taking place at all the breeder’s farms in the summer months. With modern-day methods, increased knowledge and savage culling, in recent years, it is not surprising to see Koi harvested in late September from the field ponds at 25cms or more. Most of these Koi are less than 90 days old!